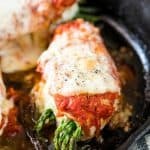 Asparagus Stuffed Chicken Parmesan is a easy, healthy dinner recipe that combines two of our favourites. Topped with marinara sauce and stuffed with cream cheese and asparagus, it’s keto friendly, low carb, gluten free and ready in 30 minutes. To start prepping the chicken, butterfly the chicken (or slice it in half without slicing it all the way through. The chicken breast should open out like a butterfly with one end still intact in the middle). Remove the hardy stalks of the asparagus and set aside. Rub salt, pepper and garlic paste all over the chicken breasts (inside and outside). Divide cream cheese between the chicken breasts and spread it on the inside. 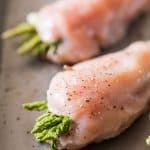 Place four stalks of asparagus and then fold one side of the breast over the other, tucking it in place with a toothpick to make sure it doesn’t come open. Preheat the oven, and set it to broiler. Add butter and olive oil to a hot skillet and place the chicken breasts in it. Cook the breasts on each side for 6-7 minutes (total time will be 14-15 minutes depending on the size of the breast) till the chicken is almost cooked through. Top each breast with 1/4 cup marinara sauce, and divide the shredded mozzarella on top. Place in the oven and broil for 5 minutes till the cheese melts.